I’ve kissed some frogs in my time, but I’ve never kissed one of Darkseid’s lackeys. Power Girl can’t say the same, as this issue opens with her locking lips with Desaad, Earth-stranded Apokoliptian. She’s at a party in her other identity of Karen Starr, he’s impersonating Michael Holt, aka ex-boyfriend Mr Terrific. Unsurprisingly, a fight ensues and it’s anything but a lovers’ tiff. Helena Wayne is around, and while she hasn’t got her Huntress gear to hand, she improvises, showing Desaad that super-powers aren’t necessary to make a hero. As well as Desaad, the Worlds’ Finest heroines have to fend off Holt’s bodyguards, who see their boss, not Desaad, being assaulted. Power Girl carries Helena away, to fight another day. 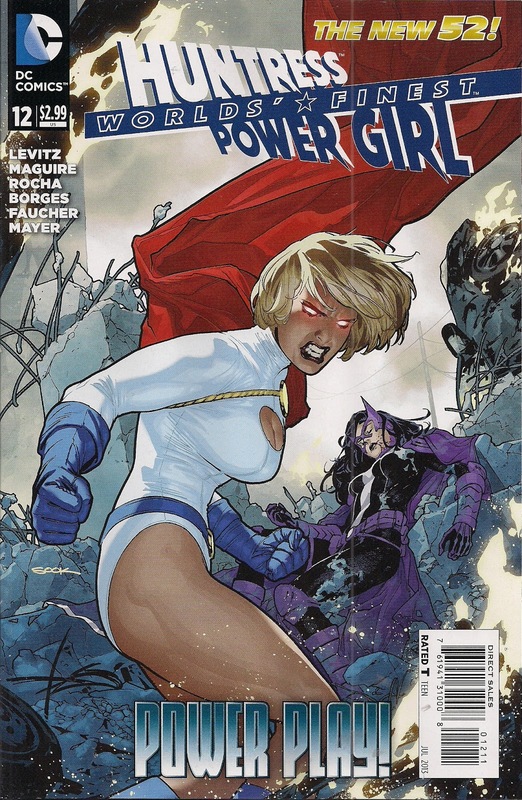 Flashback a few months to Tokyo and we see Huntress stymied as she tries to solve the riddle of Hakkou – the Apokolips-connected thug from #1 – and Power Girl frustrated that she’s missing a party to give Helena a lift home to Gotham. Back in the present, at the Starr offices, Karen is annoyed that her top boffins are being poached and her stock is falling. Helena reckons Desaad-as-Holt is behind it. There’s no time to worry or fume, though, as Karen’s secretary, Somya, has news that sends them scurrying away at super-speed – one of her research labs has exploded. And I’ll say no more, but I believe the euphemistic colloquialism is ‘things get real’. This issue’s climactic events look to be the impetus for Karen and Helena to finally get their (euphemism time continues) act together and shut down Darkseid’s disciples. I’m certainly ready for this year-long storyline to wrap, allowing for a greater variety of storylines. Not that I’ve been bored, mind – every issue has heaps of incidental pleasures; I just want the main event to be as engaging as the banter and bits of business. And I’m ready for the flashbacks to vanish, leaving the splendid characterisation for an all-present day-set book. This time, the main event was more fun than usual, as writer Paul Levitz gives Desaad a creepy charisma – he’s corny as heck, but lots of fun, in a leering, spiky-toothed way. As for the incidental pleasures, there’s Huntress’ way with a curtain rod, some speculation about Desaad’s historical links and a suspected crush confirmed. Best of all, there’s this moment, which will surely make lovers of the Silver Age Supergirl smile (click on image to enlarge). And lovers of Bronze Age Power Girl will likely be equally chuffed to see a version of Kara’s classic costume back, as of the most recent Supergirl – just look at that gorgeous Ryan Sook cover. To be honest, I could read an entire issue of Helena and Karen simply chatting away, as Levitz writes one of the best friendships in comics. Certainly, these two are more convincing as bezzie mates than Superman and Batman were in 40 years of the original, yet differently punctuated, World’s Finest series. The first few pages are drawn by Kevin Maguire and feature his usual blend of the dramatic and comedic – no one draws a peed-off superheroine like him. The flashback sequence features some tremendous Yakuza arse-kicking courtesy of penciller Geraldo Borges and inker JP Mayer. And the closing pages by Robson Rocha and Wayne Faucher – despite a disgracefully cheesecake magazine cover of Karen and an unnecessary glamming up of Somya – are my favourite, for vibrant scenes such as this. But that’s housekeeping. Whatever happens, I’m sure World’s Finest will continue to be one of the best mainstream superhero comics around. * If any of this issue’s artists are reading, and I’ve miscredited sequences, please let me know. And thanks to Robin Piercy for remembering the name of Peege’s PA! Glad this is still working for you. I had planned to drop this book — din't feel like I was getting quite enough bang for the buck — but decided instead to read it (and maybe a couple of other DC books) a month later, digitally, to see how I like that experience at a 33% cheaper price. Sounds like an interesting experiment, Rob – report back, if you have time! Yeah, that's pretty rubbish – they tell us it's a new business, so they're monitoring sales and adjusting as they go … you might have expected them to lower the prices, rather than up the delay. Mind, DC are still cheaper than Marvel, digitally. So that was supposed to be Somya at the end! She looked so different that I thought it was new character!